Why is this? How is this? The progress and power of science and technology has been far more than expected ... it is amazing ... it is accelerating ... it offers huge potential. But why has science and technology not translated into a much better quality of life, not only for a relatively few, but for the multibillions that still live in abject poverty around the world. Achievement is so much less than what might have been expected ... there is something terribly wrong and it is not clear what it is that is wrong. There is a systemic failure of some sort ... and one bit of this failure is the lack of suitable metrics that show what is being successful and what is not. 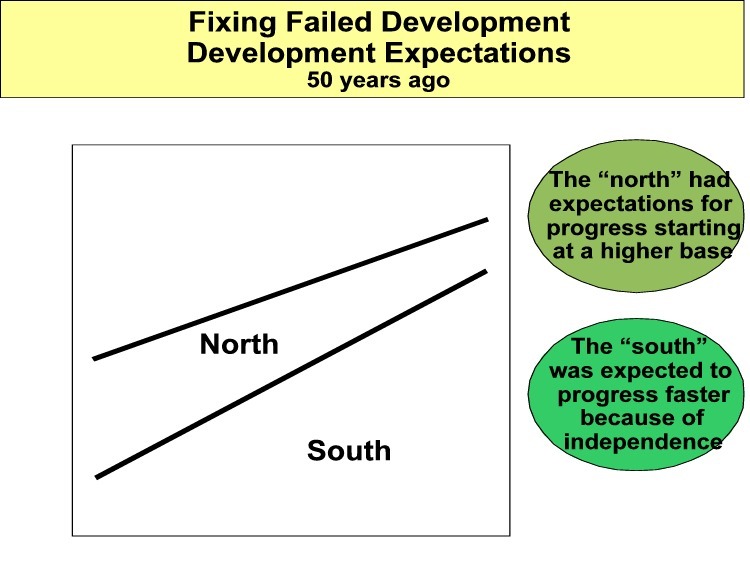 50 years ago ... great expectations 50 years ago, in the 1960s, development expectations were very positive. The European colonial empires were ending ... in good part because the old European powers no longer had the financial resources to sustain them. But the prevailing view was that independence was going to result in a new a better global society. 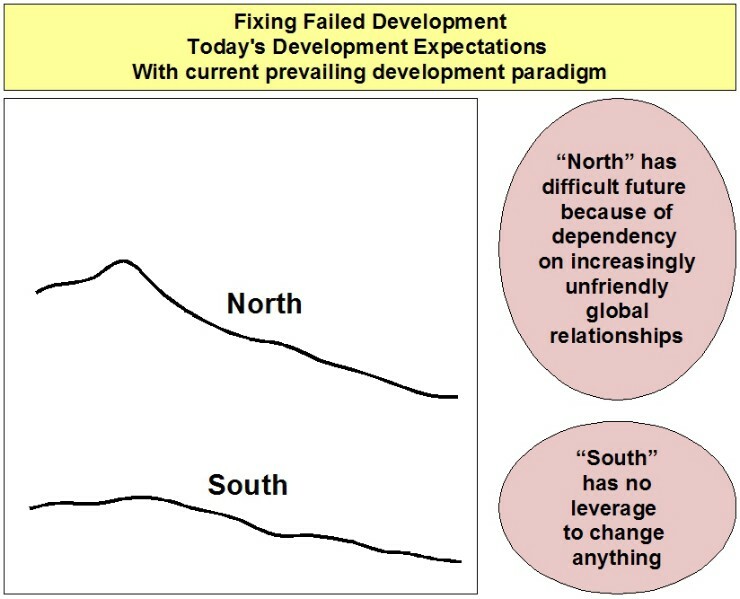 It was expected that the North would progress and that the South would start to catch up. There are some successes ... and the lesson from this is that there could have been much wider success if the governance, the leadership and the system had been tolerably effective. Or is there a better way ... the north has all sorts of possibilities with well intentioned global cooperation. The south has huge capacity in terms of human resources and raw materials but needs well intentioned global cooperation to make these abundant resources productive and valuable. A better development paradigm is not more money spent the same old way ... it is one where the legitimate hopes and aspirations of the multi-billion people in poverty can start to be fulfilled. 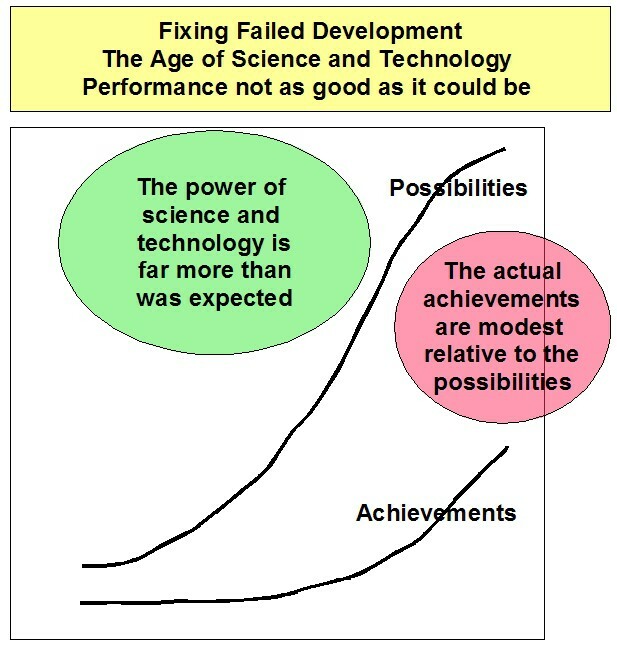 Science and technology have huge potential. But this knowledge needs to be mobilized for social good and not merely for a rather limited profit goal. People have a huge potential for doing good ... but the framework for this must be established. 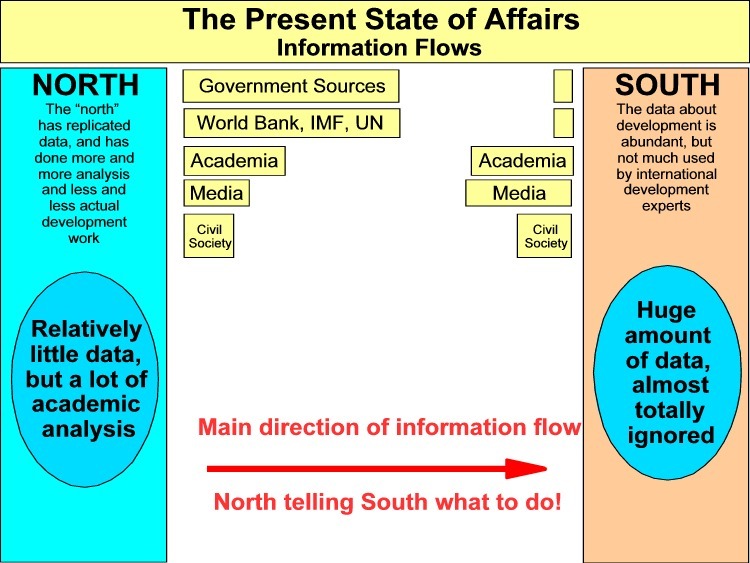 A better state of affairs would be for the North to get much more data from the South ... and to get the information into an organized form where it can be easily used for analysis. The North can add value to the data by adding in what the North knows in terms of science and technology and access to financial resources ... And the South can add further value by giving feedback about use of resources and the results being achieved. NGOs Collect data and write reports and proposals to attract funding. Publish financial reports required by regulatory agencies ... typical a minimum requirement that shows very little beyond very broad classification. Very low No data flows into the public space ... none of the data accessible for analysis. Data used to strengthen position in the industry. Government Agencies – South Most data collected in the country goes to the government in one form or another ... but is rarely used in a productive manner, and is not usually easily accessible ... if it is accessible at all. Very low No data flows into the public space ... none of the data accessible for analysis. Much data treated as secret. Scientific Research Institutions Data collected circulates within the scientific elite, but rarely outside academic circles. 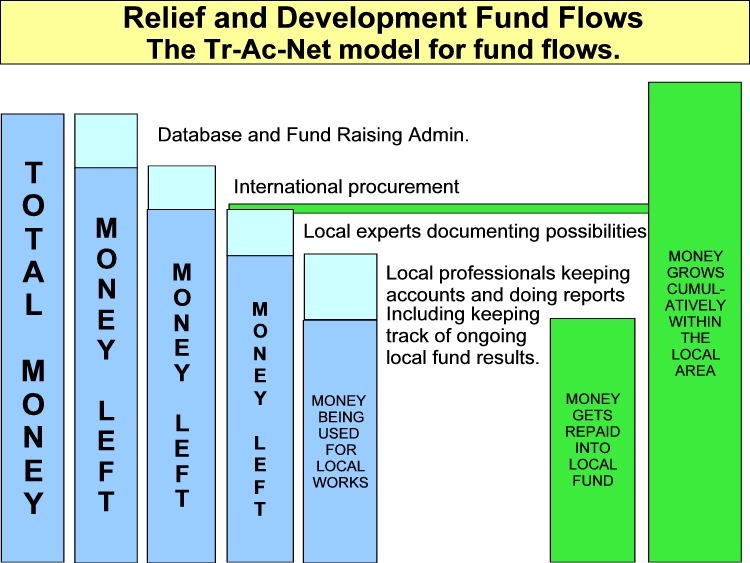 Reports are prepared that help maintain grant flows and satisfy donors. Very low No data flows into the public space ... none of the data easily accessible for analysis. Academic Institutions Some academic institutions are well funded for data collection, but the data collected seems to be used for limited goals including PhD production and for analysis that supports career development and grant flow maintenance. Very low No data flows into the public space ... none of the data accessible for analysis. Individuals Data collected and used for work being done by the individual, whether this is work being done in an individual capacity, or for a project or organization. Very low No data flowing into the public space ... however, many individuals would like to share the data so that it becomes public access data but no easy low cost vehicle for this. Corporations Data collected is used by the corporate staff to do analysis and internal reports that show performance and progress. 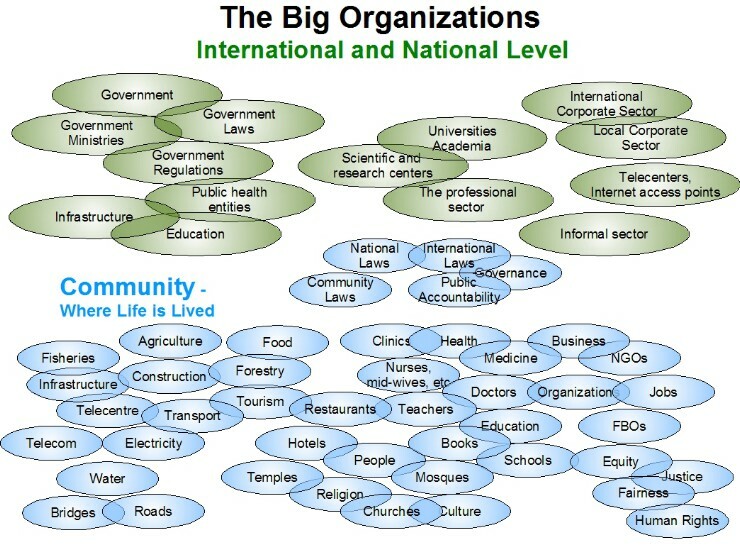 Used by the corporation to show how much of social value is being done, even where what is being done is very tiny relative to the scale of the main corporate operations. Very low No data flows into the public space ... none of the data accessible for analysis, but some material used for public relations by the corporations. Government Agencies - North Government agencies have collections of data ... but most of the data are protected from public access . When data are made accessible to the public there are usually major deletions that make the data worthless. Very low Almost no data flow into the public space ... and almost impossible to access for independent analysis. 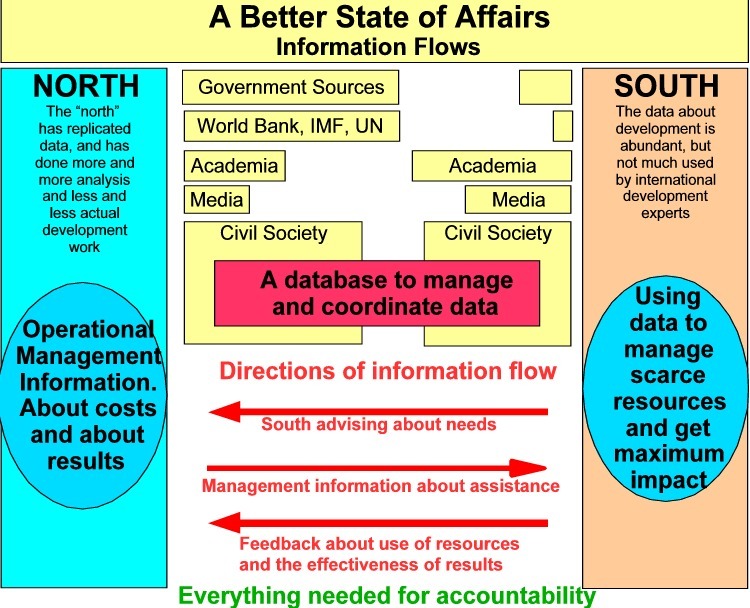 Multilateral Agencies UN, World Bank and all multilateral agencies have huge collections of data, but little of the data are able to be used in effective ways for analysis except within the system. Very low No data accessible in the public space ... but huge amount of material is published, most of which cannot be independently validated. Also chaotic It is a chaos ... nobody is accountable for anything the way things are presently organized ... everything relies in the “market” creating balance, the media providing transparency and government providing a workable legal framework! But it does not work ... and most of the world's population is paying a high price for this chaotic dysfunctionality. The graphic bellow is an enhancement of the left to right image ... with many more of the institutions, agencies, etc. included. 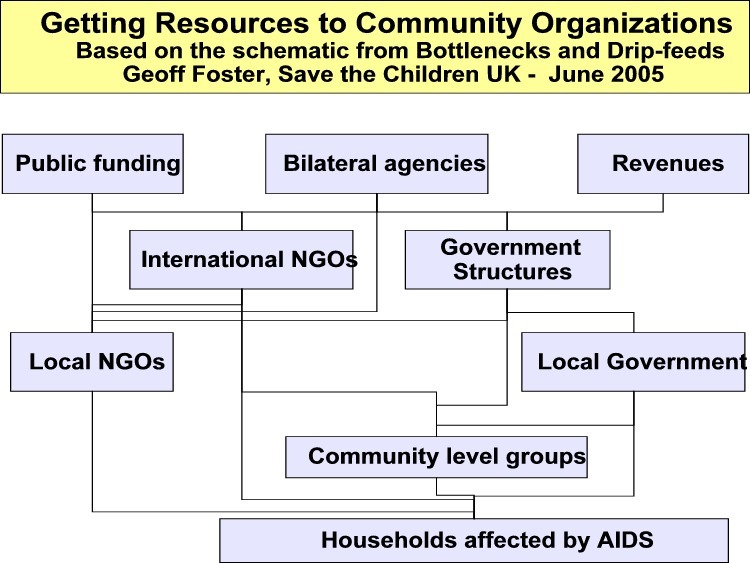 The structure on the donor side has hundreds of organizations ... with functions that overlap, work in parallel and work in series. The structure on the south side is also complex. The legal profession may be concerned about the state of the profession ... but their voice is very muted. Every legislative session, the law gets bigger ... but hardly ever gets better. 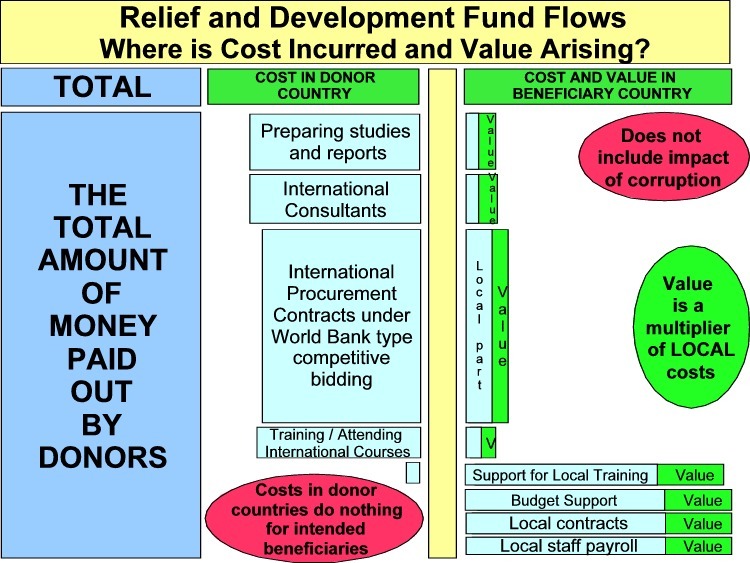 The value dynamics in the relief and development industry are all wrong. This has been a chronic problem for a long time with the institutional leadership having little understanding or interest in the issues. There are end to end problems with fund flow accountability ... some of the fund flows are severely compromised, while others are managed excellently. However, because of systemic weakness in the systems of metrics it is not easy to know which ones are excellent and which are not. Weak financial control has been endemic and as a result all sorts of resources have gone missing ... stolen money ... stolen inventory ... over invoicing ... under delivering. Embezzlement of all sorts ... petty corruption and grand corruption. 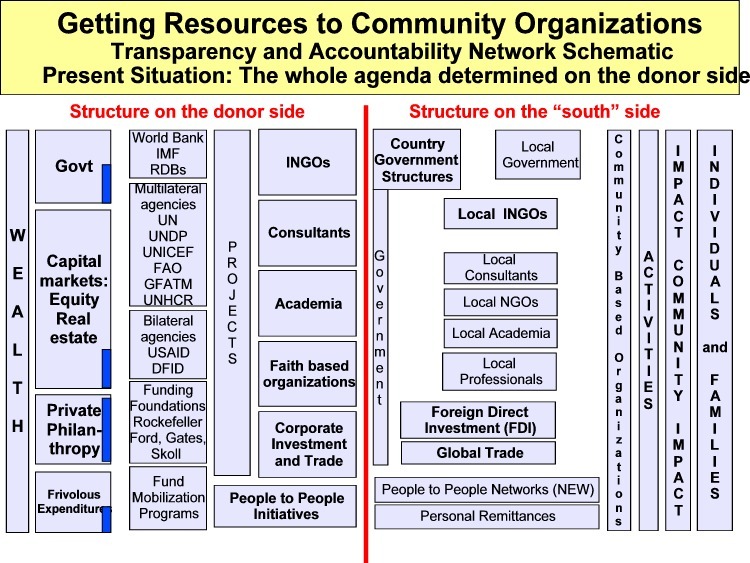 Part of the problem is that all of the participants have a very narrow interpretation of their responsibilities for transparency and accountability ... essentially every organization thinking of itself in a bilateral relationship with the donor or source of funding ... and the public having no stake in anything. In this arrangement it is relatively easy for a bilateral relationship to provide fertile ground for weak performance and worse. Little has been done over very many years to end this comfortable arrangement, and all the incentives in place encourage its continuation. The amount of money being raised for international relief and development assistance is huge. Fund raising in the aftermath of natural disaster is especially impressive, and shows how supportive many people are of development initiatives. But sadly the relief and development industry is less than candid about how the resources are used and what is being accomplished. 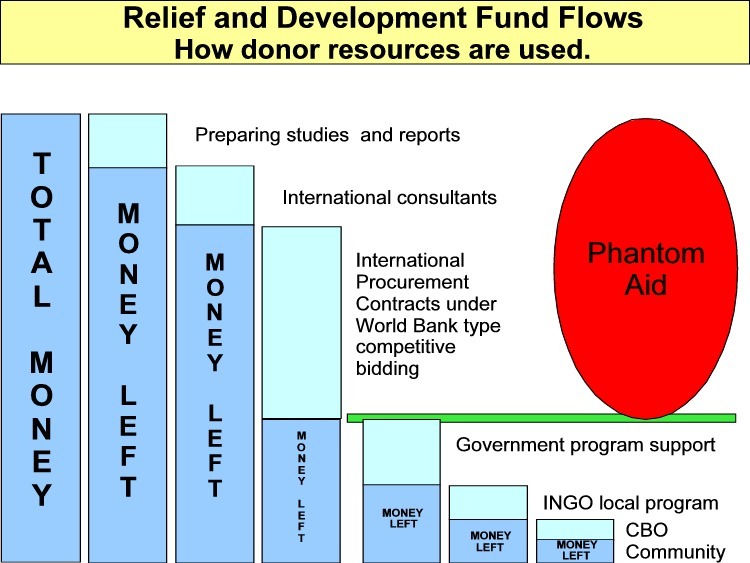 In 2003 a well know UK based NGO named this Phantom Aid. Some years before the phenomenon had been described as “Black Hole Development” implying that no matter how much fund flow there was, the results would still be the same! The idea of sovereignty that embraces the independence of a people from a foreign power is good ... but it is not good for sovereignty to be used to protect leadership that has no respect for human rights and fairness ... to protect a regime where “anything goes” to maintain wealth and power. People are being treated abominably by governments and elite leaderships ... and external initiatives are constrained by the idea of sovereignty. At what point does doing right become the dominant driver of meaningful action? The amount of money that gets spent and the amount of good that gets done seems to be more and more unrelated. Five decades or more of teaching MBA students about ways to maximize profit without teaching much about society has created a very large community of experts in profit maximization and hardly anyone that has a deep understanding of the social costs and value destruction associated with this economic paradigm. The problem, however, is worse, because the relief and development industry has many people well trained in various other disciplines, but with rather little training in this dimension of economics ... and even less trained in accountancy.. Cost, price and value are the critical metrics of socio-economic activity. In corporate market based economic thinking cost and price are the dominant metrics because they determine profit which in turns determines market valuation ... but in society there needs to be attention paid to the relationship also between cost and value. Cost is a determinant of productivity ... or is it productivity that determines cost. This is more than semantics and goes to the heart of the management of society and the effective use of science and technology for the benefit of society rather than only being used for proprietary wealth gain. A strategy that optimizes the former may well be different from one that maximizes the latter. The multiplier should be positive. The Keynesian multiplier is the economic mechanism whereby money spent by one person becomes money earned by another ... cost for one is income for another. The multiplier effect is perhaps the most important mechanism in economic theory ... yet it is rarely talked about by development experts. 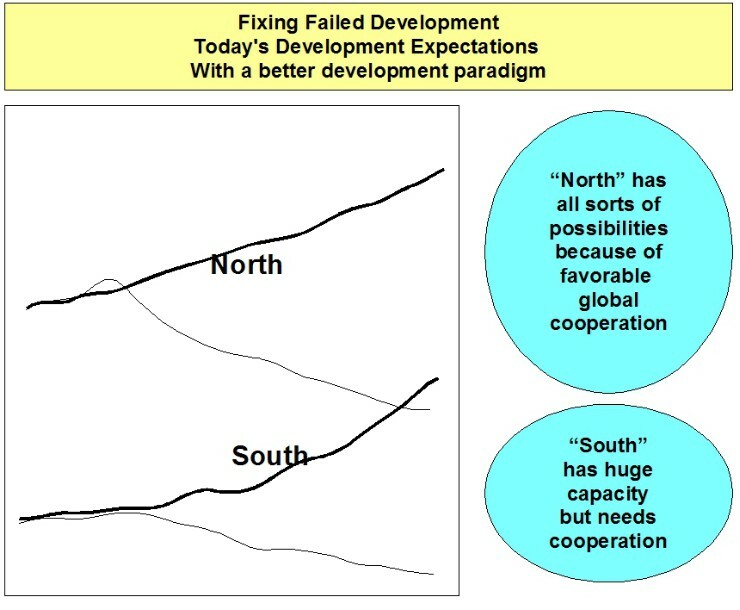 But the The ultiplier effect makes it easier to understand the failure of community progress in the face of all the local and external economic activities. 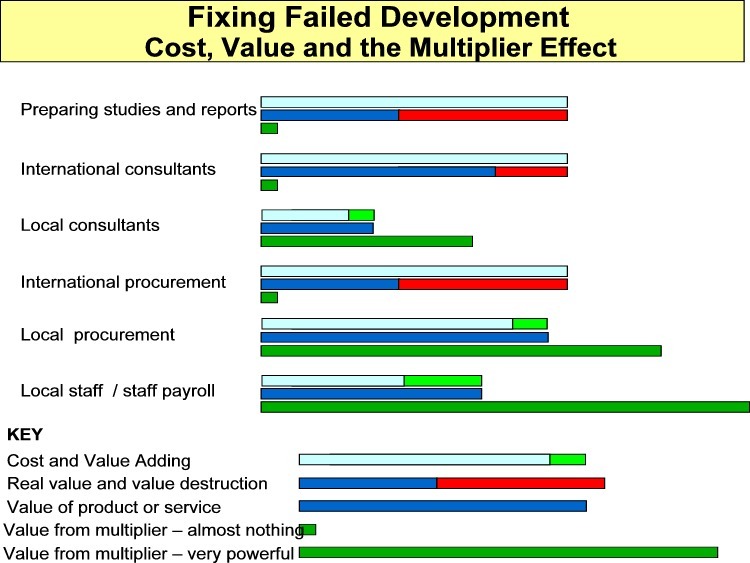 The multiplier is one of the tools for economic optimization that has been sidelined by the experts of the international development assistance community. Community Accountancy takes into consideration the impact of the Keynesian multiplier in relating costs to value for the community. The multiplier effect changes the development dynamic and makes compounding community progress possible. The multiplier effect helps to explain how many of the big initiatives over the past 40 years have had limited benefit. Big projects with foreign contractors and experts get only $1 of value for each $1 disbursed ... at best ... while small community activities get a dollars worth of value over and over again ... multiple times ... one loses count! Much better! The big projects should have had great impact, but often did very little. I learned about the multiplier is a college class ... I have observed it working all over the world. However, rarely where development experts were involved. This is not a theoretical construct. In my experience modest fund flows into a community produce all sorts of favorable impact. Lesson ... get a community started and it will never stop! Another lesson ... there is as much multiplier power as things get small are when things get bigger. Where is the funding coming from? Where are the beneficiaries? 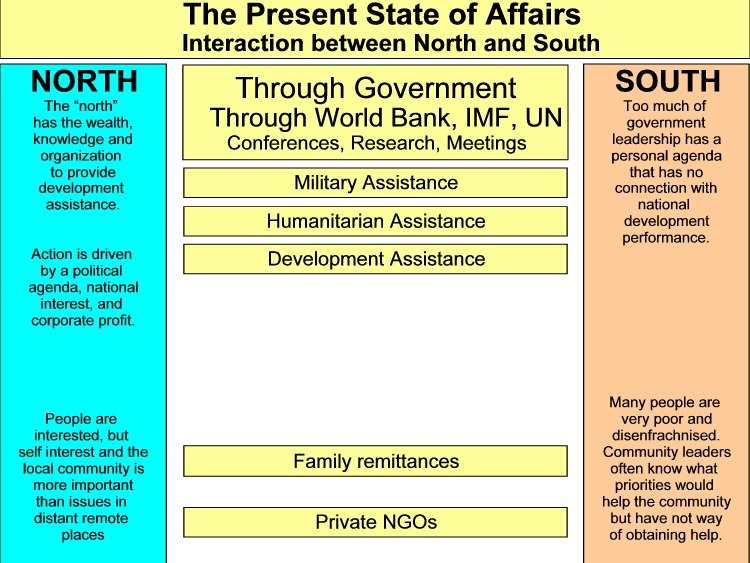 Over the past decades a very large proportion of the international official development assistance has been disbursed in the north, with the idea that it was going to beneficiaries in the south. But mostly this did not happen Most funds have been disbursed in the north where there is benefit for the contracting organizations and rather little left that is of benefit for the south. 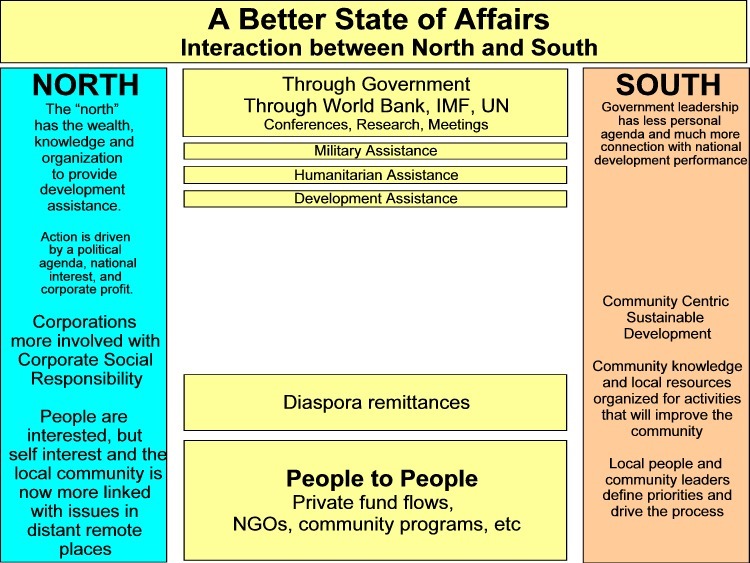 A much better way is to disburse more directly in the south where there are direct benefits and associated multiplier effects. 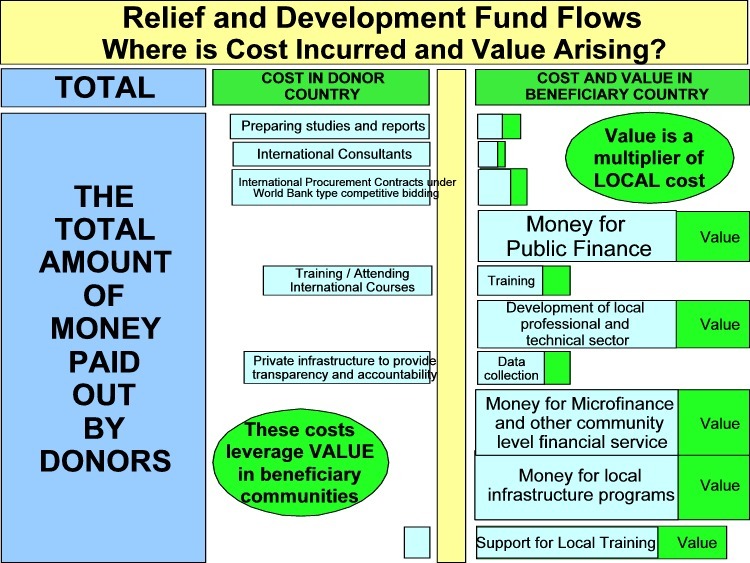 When funds are disbursed in the south, the impact of international official development assistance is very good. Local disbursement in beneficiary communities not only has a direct benefit, but delivers other economic improvement through the multiplier effect. 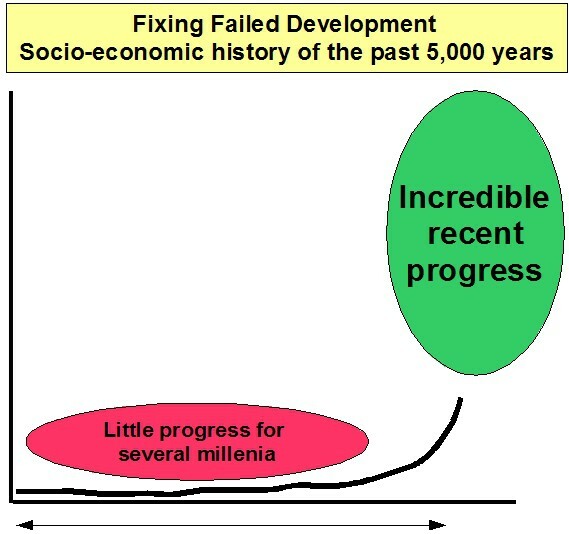 The success of relief and development depends more than anything else on whether it is economic value adding or economic value destruction that is dominant. In economic value adding the value increment exceeds the cost. 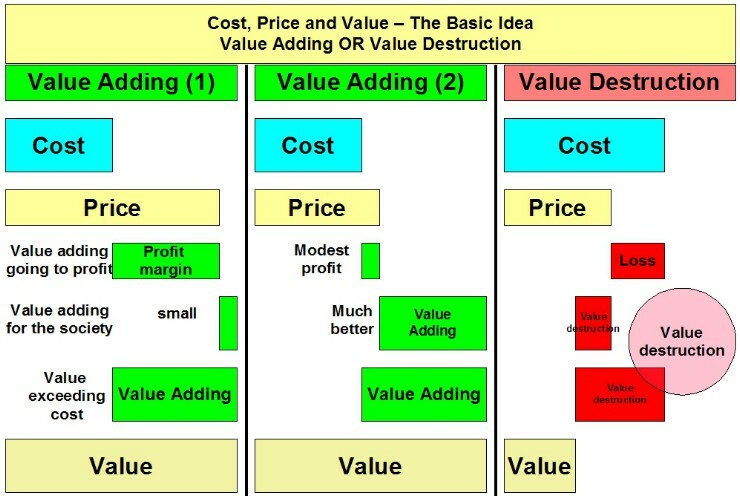 In economic value destruction the value increment is lower than the cost. In the corporate environment the price of goods and services and the market serves to control cost and ensure that the clients get value for their money. 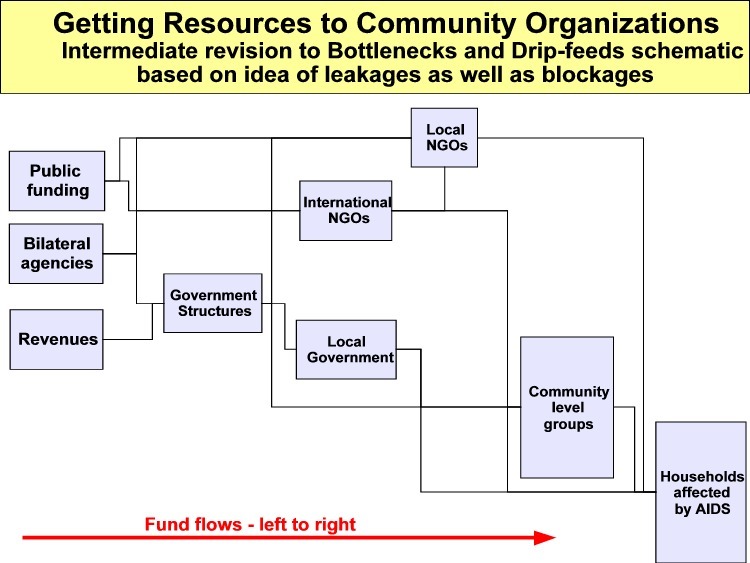 No similar mechanism exists in the relief and development sector. Decisions are made based on a process that has no independent (market) checks and balances and it is easy to commit to make expenditures without the activities and outputs have much meaningful tangible value. While the international relief and development industry and international investors talk about the benefits of external funding, it might not be as beneficial when everything is taken into consideration. The following shows something of how external funding impacts net local benefit. The simple graphic presented above is only a bit of the sad story. The damage that external funding does to the local economy and to the local communities is obscene ... not that it needs to be ... but is because the rules and the contract terms are very much in favor of the lenders and unfavorable to the borrowers. While this is common knowledge ... it has been not negotiable for the past 30 years or more ... while forcing failure on “beneficiaries”. When will the World Bank address the big issues for its projects and their financing? Nigeria borrows $100 million from the World Bank with an official exchange rate $/Naira of $1.50 --> One Naira and gets the equivalent of Naira 67 million. Decades later Nigeria is repaying the loan and the exchange rate is now more than Naira 100 to $1.00 ... and must repay the equivalent of Naira 10,000 million ... that is Naira 10 billion. Please explain how this is a good way to fund development ... when the borrower gets Naira 67 million of value at the outset and then has to repay Naira 10 billion. 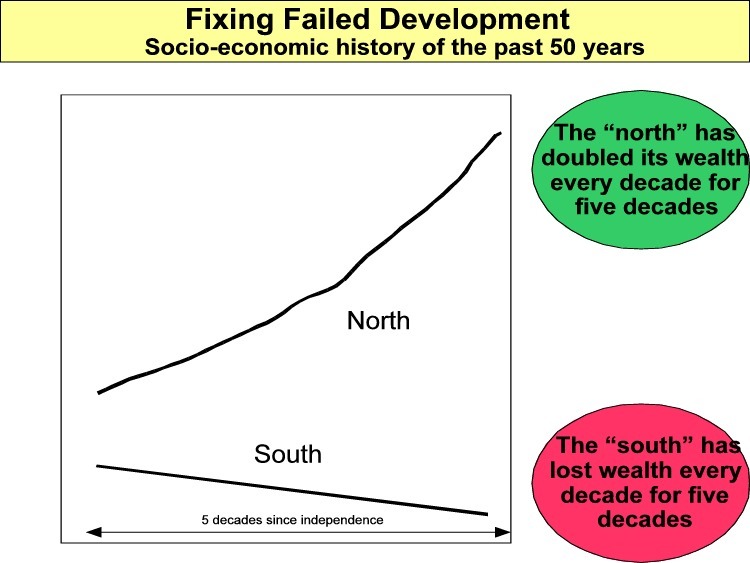 Is it any wonder that development does not work! The timeline of a typical “development” project shows changes in value starting with value consumption as the project is prepared and starts implementation, followed by value benefits as the project continues. For big World Bank type projects the length of time is significant and the scale substantial ... with the costs of value consumption certain and the benefits much less certain. 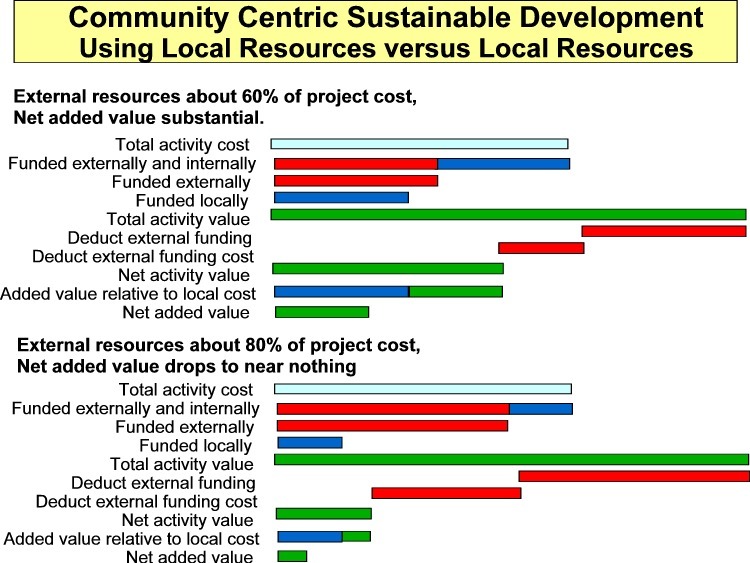 When the benefits do not materialize, the project creates massive value destruction ... and for many if not most World Bank projects this is the sad reality. Community Accountancy looks at any and all economic activities from the perspective of value creation and value consumption. The problem with the WB project cycle is that there is substantial value consumption that is sure, and long term benefit that is uncertain. The following graphic is a simple depiction of the costs incurred over a long time before a project is funded and implemented. When a World Bank project does not generate benefits there is a long term loan repayment cash flow that keeps the project in a value consuming mode for many years. While this is obviously terribly bad for the community and the economy that serves the citizenry, this is less bad for those that have enriched themselves at various stages of the project ... no matter that the project is an economic disaster over the long term. In the introduction it was stated that it is very easy to know what to measure if the goals or objectives are known. A lot of times the goals and objectives are stated ... and from this there is immediately a lot to learn. Bluntly put, it is wasting time working on the way out future while ignoring the many big things that are causing problems today ... but that is what world leadership loves to do. The 1978 Alma Ata International Conference on Primary Health Care in the Soviet Union produced a declaration that set forth some key targets to be accomplished by the year 2000 ... some 20 years into the future. And in 2000 the UN worked up another set of goals to be accomplished by 2015 ... some 15 years into the future. If the international relief and development industry has its way ... there will be more and more long term goals and objectives that cover anything and everything and go off into the future while there will be the minimum of attention paid to why it is that there has been such poor past performance and what has to be fixed now. Metrics ought to serve the needs of society ... but the easy metric that has been important in the Breton Woods institutions and their development clones has been disbursement. While there are cases where disbursement is a useful proxy for results, this is not so when it is used to the exclusion of almost anything else. Disbursement serves as a fairly good proxy for activity ... but neither can stand in for result other than in a very controlled and stable environment. Development, when it is successful, is not stable, but progressing ... and the only metric worth having is a measure of the results. The measurement methodology that now dominates the global economy is based on statistical mathematics on top of very little data. There is a place for this ... but it needs to be balanced by a 0solid foundation of accounting data and the related data organization and reports. Statistics have no capacity to provide control and accounting of resources ... something that is essential for an effective society ... and yet statistics has been used to replace strong data almost everywhere in the relief and development industry for the past several decades.